One of my favorite wedding venues on all of Long Island is Flowerfield Celebrations in St. James, NY. This property is unique in every way...there is nothing like it anywhere. Located just 15 minutes from my East Northport, New York wedding photography studio, I have had the experience of working at this incredible establishment on dozens of occasions during my career as a prominent New York wedding photographer. The room pictured here is where the caterer presents an incredibly elegant cocktail hour. 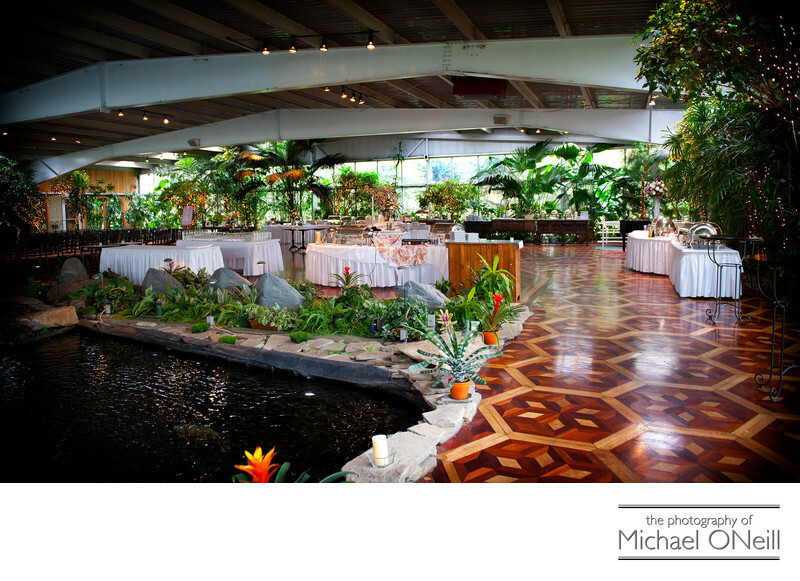 Stations of delicious food offerings surround the room which has an extraordinary indoor koi pond spanned by a dramatic bridge. Elsewhere on this web site you will see other wedding pics taken on the perfectly manicured grounds at Flowerfield and within their spectacular contemporary and elegant ballroom. Bride’s and their guests are treated to an amazing wedding ceremony location on an outdoor island which is reached by crossing a short footbridge. Perhaps the only location on Long Island that can compete with the uniqueness of Flowerfield is their sister location, Land’s End, a waterfront establishment located on the Great South Bay in Sayville, NY. If you are looking for the finest in Long Island catering at a unique location where you will be the only couple catered to then Flowerfield Celebrations and Land’s End are two places that must be on your to-see list.